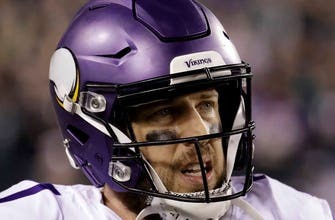 ENGLEWOOD, Colo. (AP) — Case Keenum is joining his fifth team in five years and the Denver Broncos are turning to their fifth quarterback since Peyton Manning retired 24 months ago. General manager John Elway called Keenum “a great fit for us” after the sixth-year pro parlayed a breakout year in Minnesota into a two-year, $36 million deal with Denver. Elway and coach Vance Joseph were in Norman, Oklahoma, checking out Baker Mayfield‘s pro day when free agency opened Wednesday. Then they were headed for Los Angeles to watch Josh Rosen‘s pro day at UCLA on Thursday. The Broncos were busy when free agency opened, keeping linebacker Todd Davis (three years, $15 million); adding cornerback Tramaine Brock (one year, $4 million); finalizing Aqib Talib‘s trade to the Los Angeles Rams; and trying to move Siemian, who won the starting QB job in Denver each of the last two years. Besides Mayfield and Rosen, other high-profile fixes for franchises with quarterback quandaries such as Denver’s include Wyoming’s Josh Allen, USC‘s Sam Darnold, Louisville’s Lamar Jackson and Oklahoma State’s Mason Rudolph.